It was a rare occasion that I was blessed with so much free time that I felt asleep on a weekday afternoon. I guess I was not feeling well (yes, I'm trying to make myself feel less guilty) or it was just pure laziness that I didn't wake up until 2 hours later! As a result, I had to abandon my earlier plan to bake a loaf of bread as there wasn't much time left before I had to start preparing dinner. After flipping through my stack of recipes, I thought I should make a Swiss roll. 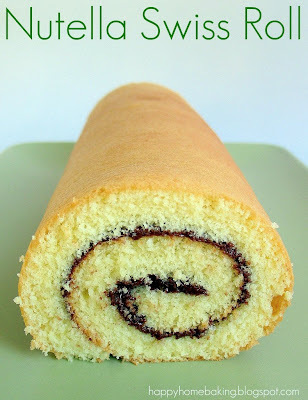 In the past, I always relied on a sponge cake recipe to make a Swiss roll. It was the first time I was going to follow a proper Swiss roll recipe. I didn't bother to use any whipping cream for the filling, as first of all, I was running out of time and secondly I am doubtful whether I'll be able to roll the cake without cracking it . Hence, to make things easy, I decided to use nutella spread to fill the roll. As with all my past attempts with Swiss rolls, I felt a little nervous when it was time to fill and roll the cake. I almost let off a whistle when the cake didn't crack upon rolling! I am not sure it was just pure luck, or was it the technique outline in this recipe that made the rolling so easy. I guess I would have to try this again to verify. Some Swiss roll recipes that I have come across would recommend that the cake be rolled up while it is still warm. The cake would then be unrolled upon cooling, filled and re-rolled again. Whereas for this recipe, the cake is left to cool off before filling and rolling. According to the recipe, once the cake is out of the oven, it has to be removed from the tray and placed in a big plastic bag to cool off. This way, the cake will stay soft and moist for easy rolling. Since I do not have a large enough plastic bag, I left the cake in the baking tray and placed the tray on a cooling rack. To retain the moisture, I covered the top with another Swiss roll tray. Upon cooling, I was surprised that the sponge layer was not soggy or damp. I moved on to remove the parchment paper and turned the sponge layer onto a clean sheet of parchment paper. It was a little tricky trying to spread the nutella as it was rather thick, I had to be extra gentle to avoid scraping the crumbs as I worked along. Besides retaining moisture when the sponge layer is cooling off, I think it is also important not to over bake the cake, otherwise it would be too dry and would crack easily. As usual, my unreliable oven took a little longer than the recommended time to get the sponge layer baked, and I had to turn the tray closer to the end of the baking time to ensure even browning. In order to make a nice clean roll, another seemingly minor point to watch out for, would be the kind of paper used for rolling. I remembered using those greaseproof papers (or tracing papers which I used to call them when I was young!) when I first attempted to make a Swiss roll. The cake got stuck to the paper, as a result, the 'skin' got peeled off upon rolling/unrolling. I also used to wonder why my cookies would stick to this type of greaseproof paper upon baking. Until much later, I discovered those are not the right type of paper for baking. I have since switched to using proper parchment paper or baking paper which has got a layer of wax making them greaseproof and non-stick as well. Perfect swiss roll there! Ah, and i've always had mine all cracked nd with bits and pieces falling all over the place! The cinamorroll cookie cutters are available at Takashimaya, where the toys section is. My friend got it for me quite a long time ago, so i don't know if its still selling. Or try your luck at ebay! They have Hello Kitty,Micky,Pooh,Piglet ones too! Such a beauty - they look like store bought! Really superb job! This is one item that I am waiting to bake but not sure if i can find a swiss roll pan to fit in my Sharp MV/convection oven. it's perfect! now i'm craving for one. very very nice! looks perfect! Hi Yuri, I think you should be able to get a swiss roll pan easily. My oven is also very small, it can only fit in a 9" by 12" pan. ur swiss roll looks fantastic!!! so far i not yet successful in making swiss roll..all FLOP! Yuri..my oven same as urs, the biggest pan that can fit is 7" x 11"
Your cake looks perfect and yummy! Im gona attempt this as well. 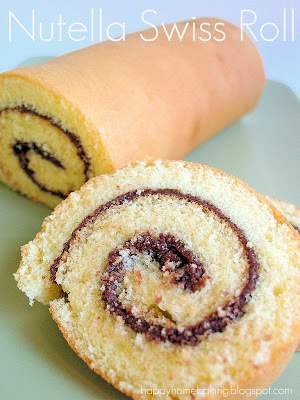 ohhh i've always wanted to try making a swiss roll...this recipe sure gives me more reason!!! LOVE anything with Nutella!! What a great cake! Gorgeous and tasty looking! Your swiss roll came out fabulous! You did such a great job rolling it up! Thanks for the tips! aiyo, i am tempted but too coward. let's see whether I have a pan thta fits this recipe. Looks simple enough. throw some bear gall over. That looks absolutely wonderful and I bet it is quite tasty! i am always looking for more creative ways to use nutella! this roll reminds me of those strawberry shortcake things you can find at the grocery store. but of course nutella makes yours 10X better! Hi, I went looking for this pan size and I couldn't find it. Can you tell me where you got yours? Thanks. I am a HUGE Nutella fan. I will for sure be rolling up this one! Hi HHB, just curious and wondering, if pan size matters in baking a successful cake, then if my oven can only fit in 9" by 9", means I have to reduce the recipe. How shd I go about calculating how much to reduce? Just half the recipe for convenience? erm, sorry, just another question. You mentioned in the recipe that eggs to be bring down to room temperature. My eggs are not stored in fridge, so I can skip the steps? or does it matter that the egg be in the fridge before? Trying to learn abit here keke. Thanks. Unless you store the eggs in the fridge, you don't need to bring it to room temperature. Eggs are easier to whip when it is at room temperature. Hope this helps. hi, i'm trying to bake this cake. I'm wondering if cake flour is the same as plain flour? Thanks for the info HHB. Wah, there are really so many things I am still not aware of .. no wonder my cakes always fail. Ur nutella swiss roll really looks lovely n yummy! Can u advise - in step 6, after removing cake from oven....we remove from the baking tray, the swiss roll including its bottom baking paper onto a wire rack?? ?...or....on the table?? ?, then cover the swiss roll with a baking tin over it?? sorry - just to let u know ive read ur detailed comments with regards to my query above. Sigh! Thts me - in my haste, i missed tht part! Was thinking of maybe trying out your recipe but i jus want to make sure if it was my rolling technique or the recipe's problem. Wanna find out from you how do you actually make such perfect rolls without cracking it? Also, wat sure the texture of the cake should be? I don't think my cake was dry cos when i pressed it lightly it was quite soft and springy with some squishy sound. But one thing, I had some difficulty folding in the flour as it was form lumps which were difficult to incorporate nicely into the egg+sugar mixture. When i tried rolling the cake, it felt quite inflexible and i was really afraid that if i had use any more force it would crack. but i couldnt get it to "roll" so i decided to use a lil more force and sigh..it gave way. Just wanna ask if the cake feels inflexible or? pretty upset cos i tried twice and failed on both attmepts. I think I consider myself very lucky when it comes to making swiss roll. So far I have made about 5 ~ 6 swiss rolls, only once or twice I got cracks on the swiss roll, but it didn't really give way, just some cracks on the surface. I think the cracks were partly due to over baking as my oven is not very reliable! As for this nutella version, it was my first attempt using this recipe. I followed the method as outlined in the recipe and I make it a point to stand in front of the oven...once the sponge layer starts to brown all over, I remove it from the oven to prevent it from over baking. Then, I followed the method to cover the sponge layer immediately to retain the mositure. Upon cooling it, I had no problem with rolling. I can't recall whether the texture is surpose to be 'flexible', but I could roll it without much effort, except for the initial first fold. I didn't use any tools at all, just lay the sponge layer on a parchment paper, and with the help of the paper, I lift up the sponge and start rolling (very much like rolling up a sushi maki). The other possible cause could be the thickness of the sponge, do try to follow the recommended tray size, maybe your sponge layer was too thick?? As for flour trapped in the batter, I have not encountered this problem before. What you can do is, when the batter almost reach the ribbon-like stage, you can lower the speed of your mixer, this helps to stablise the air bubbles, and the bigger ones should disappear. The other thing is, do remember to sieve your flour. I always sieve it three times whenever I make a sponge cake. I hope you wont be put off by your failed attempts, I am sure with a few more practice you will be able to get it right. Let me know if you have problem understanding what I've written as I am really very loh soh! Good Luck! Anyway, I used a 9"x12" tray and baked at 180C for about 10-11 min. it didn't brown entirely (just browned v v lightly) but since the toothpick inserted came out clean, I jus took it out from the oven. I didn't have another swiss roll tray of the same size so i jus covered it in aluminium foil. in any case, I just rolled it up and rerigerated it. So when i came back online to check on more tips, I saw that video link you post from meji and took a look. I realised i probably should have tightened the roll and it probably wouldn't have cracked. p.s. i think i'm MORE lo soh den you hehe. thanks once again! so so terribly sorry for the multiple postings, just to make sure, when you remove the cake from the oven, do you remove it from the tray before covering it with another tray? Hi You Fei, no worries. I left the sponge layer in the tray and cover it with another tray. According to the recipe, you should remove the sponge layer from the tray but with the parchment paper still in tack and place it in a plastic bag. I consider myself new in the area of baking, as such, I doubt I am capable of posting step-by-step photos...since I have not attended any baking course or workshop, I am really not sure whether I am doing the correct thing!!! I don't want to be seem as "班门弄斧", hope you understand my situation. Furthermore, I do not have the necessary equipement like a tripod, it is difficult to take photo while I am mixing the batter, and I can't count on my kids to take video or photos for me. I hope you understand. There are many demo videos available online, you can refer to them to get an idea. Don't worry I understand your situation perfectly. As you've mentioned, you said you left the cake to cool in the tray while covering it with another tray, wouldn't the cake continue to "cook"? I didn't have to worry about the sponge layer continue to cook in the tray, as I use an aluminum/tin tray...it conducts heat very fast, once it is out of the oven, it cools off very quickly. I think i have probably the same kind of tray as the material seems v light and thin. I couldn't resist but giving your recipe another try and this time....i made it!! =DD I followed what you did and stood vigilantly in front of the oven. (However, it still did not brown as nicely as yours) I was so afraid that it'd overbake, to as soon as it looks QUITE brown, I took it out (the toothpick inserted was clean) that took around 6-7 min in a 180C oven. I might consider baking longer next time to see if there was any difference. I tried to roll like yours, but the skin started peeling off while i handled it while trying to place it properly on the parchment to roll. So I rolled it with the brown side inside instead. My sister and bro loved it and they all said its very yummy. However, one of my sisters did mention it was abit too airy. hmmm *scratch* head haha oh well, personal preference i guess. Thumbs up for the recipe! I guess standing by the oven helps! Hi HHB, forgot to ask you something. any tips on how you managed to get such a smooth layer? my batter always seems to have alot of air bubbles. no matter how i try to smooth it, the bubbles still appear. Is this normal? My oven has got hot spots, certain part will start to brown first, so I have to turn the tray around to make sure the surface is evenly brown. I can't tell you the timing, as I usually have to estimate. You can try it next time. As for the air bubbles, after you spread the batter onto the baking tray, u can tap the tray on your work surface to release the trapped air bubbles. What kind of baking paper are you using? If you are using greaseproof paper, the 'skin' will stick onto the paper when you roll it. I use parchment paper which is non-stick. It does make a difference. I was a little afraid to open the oven door to rotate it for the fear the cake would collapse and the oven temp would drop. Anyway, I THINK i'm using parchment (I use GladBake) is that the correct one? Oh ya, so is it normal for my batter to have air holes? As in, I'm a doing the right thing? Hi HHB, forgot to let you know that, my success came with your meticulous "guidance". Without your detailed suggestions, I doubt I'd be rolling up pretty swiss rolls. You mentioned you use the same brand, but I realised it is a little short to tighten it at the sides. i.e. make it like a BIG sweet, like twisting it at the sides. Do you encounter such problems? or are they selling bigger size ones that I don't know of? Was browsing through your blog and once again, went back to admire your beautiful chiffon cakes. I've been wanting to try out a chiffon cake for quite sometime but I don't have the correct tin. I tried looking for one at sunlik the other time, but they didnt have 16/18cm ones. May I know where did you get your chiffon tins from? Hi You Fei, I got the chiffon pan from Phoon Huat. So sorry for the endless questions and multiple comments. I realised that the swiss roll became a little dry after a night in the refrigerator. Is that normal? I've started to learn baking (self-taught) about 2 weeks ago when I suddenly feel like baking "Black Forest Cake" for my eldest son's birthday. Lucky for me, I've been quite successful. So, I became ambitious and wanted to bake a christmas log cake for this Christmas gathering at my Mom's place. Today, I tried to bake a swiss roll but failed twice. Yes, I used the greaseproof paper and like you said, the cake stuck like mad. I was wondering if I could use aluminium foil to lay the swiss roll pan (mine was 11 by 14 inch). Anyway, really love your blog and your beautiful cakes. I'm also hoping to have a blog like yours featuring home-cooked food and self-baked cakes. Do drop me a note when you set up your blog! Wow, thks for the speed reply. What I mean is to line the pan with aluminium foil instead of parchment paper. Reason I ask is because I saw in another recipe that allows lining with either parchment paper or aluminium foil. Anyway, I've managed to buy the parchment paper and bake a chocolate swiss roll for the 3rd time today. This time, it didn't stick but it crack like mad when I roll it up. It not only became a 3-layer cake but the texture of the cake is hard. Also, the sponge looks thin (I can only find a 33 by 23 cm tray). Don't know why it didn't rise (I use self-raising flour). I will try again tomorrow. Will let you know if it's successful or not. Will also let you know if my blog is up but I think it will not be in the near future as I still do not have many good recipes. Have a nice weekend! Finally! I've done it. I managed to roll up my swiss roll without breaking. The 'skin' was a nice light brown and smooth and the cake was soft and fluffy. This time, I whisk the egg yolks and whites separately. However, I made one mistake by spreading too much chocolate ganache onto the roll which when the roll was cut, the ganache oozes out and made the cut roll looked messy. Will definitely try many more times to perfect the skill. I just stumbled upon your blog and like the way you write and your photos are beautiful! I just tried your Nutella Swiss Roll recipe and it didn't crack! :) Everything went on well. BTW, i linked your blog in my blog post and i hope it is ok with you! Thanks! How do you find the texture? I tried this recipe and it is really delicious! However, as I was using my mom's microwave/convec oven, it didn't turn out all that well. The cake was a bit sticky and also it went flat very soon the moment I added the flour and butter. I also used vanilla essence instead of extract. I'm not sure what I did wrong. =( I hope I can get some tips from you. 1. May I know which brand of oven do you use? 2. Should I use the top/bottom or both heating coils? 4. Can I use the same amount of vanilla essence to substitute for the extract? 5. How can I prevent my butter and egg mixture from flattening during the folding stage? Hi Baking gal, if the cake is sticky, maybe you have underbaked it? 1. I use Tefal's electric tabletop oven 20L only. It is not a good oven as the temperature will drop by 20degC after I put in the cake! 2. My oven has got only one heating coil at the top. But I guess you should use both top and bottom for even heating??? 3. Sorry I am not sure about this convection function. You will have to try/test out your oven to get a feel of how it works. By opening the oven too many times during baking will cause the temperature to drop, as such it will also affect the outcome of your bake. It is quite good for it's affordable price. 5. You need to fold in the flour with a spatula. First make sure you sieve the flour about 2-3 times before your use it. When ready to add, sieve it over onto the batter, in 3 separate additions. Fold lightly and quickly. You can refer to my video on 'Making a Roll Cake' (under Links to My Video), although it is not very well taken. The other video demo link is available under my post on "Santa Claus Cake", but it is in Jap, however, it is quite self-explanation. You can do a search on Youtube, and I am sure you can get many demo clips on how to go about making a swiss roll or a sponge cake. You can also try covering the surface of the cake with cling wrap to retain moisture. just use cling wrap and stick it to the surface of the skin will do. I'll try out your tips the next time! HI! can i ask - what size eggs do you use??? i always have a problem with my swiss rolls they turn out very dry.. i usually use eggs which are 55g with shells. Wondering if its dry because the eggs too small so there is too much flour. thanks! Hi, I use eggs that are around 60-65g with shells on. Try not to overbake the swiss roll. You should remove it from the oven, once the surface turns golden brown. Hi, I am going to try the swiss roll tonight..got a some queries here: add in the melted butter- do i need to melt it over low heat? notice there isn't any baking powder used in this receipe..is there a miss out? never bake swiss roll before so here another stupid question will the cake rise slightly? Hi Emily, yes, melt the butter over low heat to prevent it from burning. No baking powder is used as this is actually a sponge cake. It depends on the beating the eggs and the sugar to create the volume. Do make sure you beat till the batter becomes double/triple in volume, thick and leaves a trail when u lift up the whisk, and fold in the flour carefully. Hi, do stick to the recommended pan size in all recipes...besides the thickness of the bake, the temperaure/time taken to bake has to be adjusted if you are using a different pan size. I suspect you may have over baked the sponge layer. Since you have used a larger pan, it will get baked faster since the layer is thinner. What a beautiful swiss roll! Not only did the skin not tear, it did not crack too! Beautiful! cannot roll at all, and to avoid deflate the batter, i just fold in the flour... but i saw flour after it is cooked. Hi carcar, I think maybe you over bake the sponge layer so it became dry?? When folding in the flour you will need to scrape all the way to the bottom of the bowl to make sure that all the flour has been incorporate into the batter. I read your blog and you have done a beautiful swiss roll, maybe you want to try that recipe again and see whether you can find out what went wrong with this one? thanks for your prompt reply. and thanks for visiting my humble blog. erm, my own recipe is with baking powder but yours without. till i see golden brown on top..
thanks for pointing out my problem in folding in the flour! ya i was so afraid if i will mess up the batter that's why i 'dare not'scrape all the way to the bottom of the bowl! I tried baking this swiss roll recipe today and follow exactly the same measurement as yours. Unfortunately, the cake cracks and rather hard. It resulted unable to roll and I discard the cake.. quite disappointing. Can U enlighten me why my cake crack and texture is hard. Hope u can share so i can improve further. thanks. I followed ur steps accordingly except that i substituted cake flour for normal plain flour. I'm so glad that it turned out to be quite a success. It rolled quite easily except that the surface of my swiss roll is not as smooth n perfect as yours.. I am not sure about the crumbs falling apart...maybe you can try using a serrated knife instead? It is good for slicing bread, if you are a local, you can get a serrated knife at Daiso for $2. Does your sponge cake taste dry? If yes, then maybe it is slightly over baked, you can try brushing the surface with some syrup (dissolve some sugar with water) to moisten it. Hope this helps. Thanks for ur reply.. But sad to say, i tried making it again yesterday for my sis but it failed terribly.. I used normal plain flour but i tried to add abit of cornstarch (with reference to joyofbaking) to make it cake flour.. I dunno if this is the reason of the failure, but I guess it is slightly over-baked n i start to see cracks the moment i remove it from the tray to cool.. When spreading nutella on the cake, i knew it was going to fail cos it was very easy to spread, no crumbs falling at all.. After that was more disaster, it cracked terribly when i was rolling but i still manage to roll it up.. The first roll was ok, moist n the skin did not stick when i was rolling, however on the 2nd attempt, it cracked n stick onto the paper. I tried to dust icing sugar to cover up the ugly skin but i think i made it worst..
Hi Hui, sorry to hear about your failed attempt this time :( I can understand how you feel, especially you are making it for your sis. It could be due to the corn flour, maybe next time you just use plain flour, or get a pack of cake flour. I am sure you will have fun making the doggies cookies! hi, i lo9ved your blog, looking at the food made me hungry everytime. Anyway i tried 3 times to make nutella swiss roll but failed everytime. They were usually not moist & soft enough to my liking and always crack when I rolled until i saw another recipe in a book. It state to put ovallete and since then my swiss rolls have always been perfect! Moist & soft, does not crack upon rolling. Use a dry towel to roll it up! if i use all purpose flour instead of cake flour, will the sponge cake still be soft and light? Hu Sue, you will need to use cake flour for sponge cakes. i followed your recipe but when i tried to roll it, it broke and ended up looking like a 2.5 layer sponge cake. 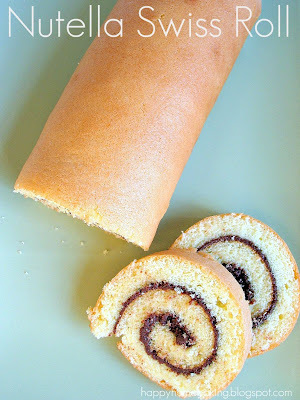 do you know of any tips i could follow to make a proper jelly roll? also, i thought it tasted great, but when i gave it to my family, they all commented on how it was a bit dry. would adding more butter help to make it moist? and also, the top layer of my cake didn't turn out light brown like yours, even though it was cooked for 10 minutes. the inside was like yours, but the top was the same color as the inside. should i coat the top in butter when it's almost done cooking or something like that? thanks so much! i really enjoy your recipes! Hi Sue, your oven temperature may not be accurate? Did you use an oven theremometer to check that it is preheated to the right temperature before you put in the cake? Looks like your sponge layer did not brown. The brown crust is not from brushing with butter. Did you place the sponge layer in a plastic bag or cover it to keep it moist when you leave it to cool? If the sponge layer is too dry (either from over baking or left to cool uncovered) it will crack upon rolling. Also did you beat the eggs and sugar mixture till it becomes pale, thick and double/triple in volume, and leave a ribbon like trail when you lift up the whisk? This is important to get the sponge cake right. You can take a look at my vido clip on Making a Roll cake (side bar) to get an idea. Hope this helps. i have a digital oven so i set the temperature and it beeps when it's the right temperature. i covered it and it did stay moist. i beat the eggs for 7 minutes and it was pale and left a ribbon trail. im not sure what went wrong because everything seemed right. i think the cake was actually really good, except that it didn't brown and broke upon rolling. May I know which brand of parchment paper did you use? My attempts on two different types, failed i.e. sticky. Hi Shurrei, I use the brand "Glad". Thank you for sharing your lovely swiss roll recipe, i have tried baking yesterday, it came out very nice at first but because i rolled it while it still hot so it turned damp and cracked when unrolled. I m using 9'X10' tray (its the largest that can fit my oven)do i have to adjust the baking time? The texture is a bit rough, is this due to the sifting process? FYI, i only sifted once. One last question, if i reduce the sugar quantity, will it affect the recipe? Hi Carris, the rough texture could be due to the baking time, you could have over baked it. The other possibility is the folding of the flour, the batter could have been deflated. Reducing the sugar amount will cause the sponge layer to turn dry, so, do stick to the recipe. Hope this helps. hi..not sure if im doing a right thing but i have come across 1 profile in FB advertising her swiss roll business using 1 of ur pic above..
You can search for Honeysuckle Treats via FB. Not sure if the FB profile do belongs to you & I hope u would check it out. Hello, I tried your recipe twice, exactly to the T and the mixture barely rose. Is it possible to show a video of this baking? Hi! just wondering, when you fold in the sifted flour in 3 different additions, may i know how would you know when each addition is done? Is there a possibility of over folding the flour inside? if there is, may i know how to prvent it? Also, do i sift the flour once or twice? Hi! the cake looks amazing! But i only have a 10" x 12" rectangular pan. May i know if i can use this size to bake it instead? Would it be very hard to roll up if i use this size? And also how should i change the timing if i use this? Hi Anonymous, your tray is slightly bigger, it means that the sponge layer will be thinner and you will need to adjust the baking time, it probably takes a shorter time to bake. Do not overbake. Hope this helps. Thanks for the fast reply. Hm, how do i tell if i overbaked mine? And how do i tell if the product is completely baked alrdy? Hi Anonymous, first, make sure your oven is preheated to the correct temperature. Do Use an oven thermometer. Place the baking tray, preferably at the middle of the oven to ensure even baking. The sponge cake bakes rather fast. So do stand by at your oven, after 5 mins of baking. You will notice the surface starts to brown. Once the top becomes light golden (about 10-12mins into baking), the baking should be completed. You can test with a toothpick, it should come out clean, or, gently press the surface with your finger, the indent you left with your finger should spring back immediately. Over baking will give a dry, and hard sponge layer, the sides will probably be over browned and crusty as well. for the ingredient conversion. But it may not be that accurate. 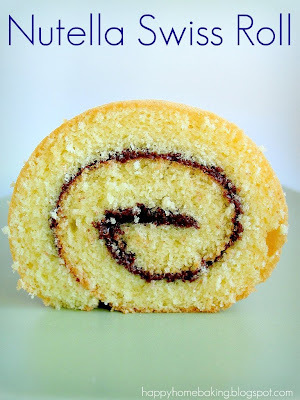 I searched for ever for a good recipe for a swiss roll, jelly roll or what ever you want to call it. I loved your pictures and the encouraging comments so I went with your recipe which I messed up the first time but immediately started over. The first batch, I forgot that I doubled the ingredients and had some doubled and some not and by the time I realized I could not fix it so I threw in the stuff I forgot and baked cause... well, I could not toss it. That batch came out thin but not terrible I filled and rolled and hey not too bad. I think the roll cracked a little because of the lack of moisture...you may have over baked the sponge layer a little; also when left to cool off, you need to retain the moisture by covering the sponge layer to prevent it from getting dry. I have tried your recipe and everything turned out perfect except for the 'skin' on top of the cake. After cooling, when I tried to roll it with a parchment paper, the skin was sticky and stuck onto the paper, leaving me a skinless roll! Unlike yours with the perfect golden-brown skin. What do you reckon cause the skin to be sticky after the cake cooled? Is it because my temperature was too high or low? The cake texture was perfect - spongy and not dry at all, and I had no problems rolling it. Thanks for your input! Hi GFAD, it is not due to the oven temperature. I suspect it is due to the type of baking paper you used. Did you use greaseproof paper instead of baking/parchment paper? When I first started baking, I didn't know that greaseproof paper and parchment paper are different things. If I were to use greaseproof paper (cheaper and comes in bigger sheets) to line my baking tray, my cookies will get stuck to it. I believe non-stick baking or parchment paper (I use the brand Glad) has a layer of wax which will prevent the skin of the sponge layer from sticking onto it. Hope to hear from you whether my assumption is right. hello. first off, i'm soo in love with your blog and I really appreciate it! I'm new at baking and I'm on a mission to try making a swiss roll. Hence it brings me to my next question.. althought it might sound stupid but.. what kind of sugar do you use for this cake? Hope to hear from you soon and keep posting! Hi Chris, thanks for dropping by. I use caster sugar for this cake. Hi Mrs Zhuo, did you beat the eggs and sugar until the batter turn pale, triple in volume? Also is the finished batter thick and airy? If yes, then maybe u may have over baked the sponge? I live in the US, and I don't have a weghing scale to weigh quantities. These are the US equivalents I could find online. I'm hoping these are correct? Hi, I usually use this conversation: 1 cup of sugar is 200g , 1 cup of cake flour is 130g. The best is to use a weighing scale. Also, for this recipe, please use caster sugar as it is easier to dissolve when beating with the eggs, hope this helps. your instructions are inspirational - thank you. maybe you can warm up the nutella to soften before spreading? Hi Hakim, I am sorry I do not know of any other alternatives to parchment paper....maybe you can try roll with the skin facing up? that is, the skin will be rolled inside the swiss roll? Brilliant. Easy to make as i'm 11 years old and mine came out perfect. Sometimes it helps to roll it using the first method, which is rolling it and wait for it to cool, then put filling in it. Melting nutella also helps too. ive bake this cake twice, turn out perfectly great!! im bake it again today with different filling. thanks for the recipe!! this cake steps may sounds complicated if you read all how to BBH roll and cooling technic. is very easy, no deflated or what so ever just remove the cake like other cake to cool it on the rack and roll up. is all good to me. This such a small cake so the cooling time is very fast perhaps in 30mins all done. Hi Rachel, this is strange. Did it crack cross wise or length wise? Hi, I don't think it is available in English or Spanish, only Japanese or Chinese. May I know What brand of parchment paper you used? I use the brand Glad easily available from local supermarts. Thanks for your prompt replied. I'm using this brand also. But why is my Swiss roll skin still peeled Off? Any advice? May i know what is the height of you swiss roll pan? I have cookie sheet and the height is 0.75 inch, can i use it for baking swiss roll? Hi, my baking pan is 1 inch in height. You may use your cookie sheet but the sponge layer will be thinner and you may have left over batter, which you may bake them in paper muffin cups. hope this helps. Hi Patricia, I am no professional baker and I have not attended any baking class or workshop, as such I can only comment on what I have learned from books or websites or thru my baking experience. There could be two possible reasons...the sponge cake layer could be underbaked, causing the skin to stick to the paper; the sponge layer was too moist as it was left to cool for too long (I noticed this when I baked cheesecake: the skin will stick to my fingers if I were to touch the surface after the cake has been left over night. but when it was still warm and just cooled off, it doesnt stick). Both these points may not be the actual cause though. I have also googled and found this site: (http://www.ellenskitchen.com/recipebox/swissrol.html) you may want to follow some of the tips stated there. I am sorry I am of not much help, hope you understand. Thank you. You've been so helpful. Must be scrumptious! I just love nutella. spread the filling, seems to be too hard. although i am still able to roll it up. Hi baking fun, you could have over baked the cake layer, or your oven temperature is on the high side. The type of baking tray you used could also be a possible cause especially if it is those non stick type which tends to conduct heat faster.